My Grandfather was John Joseph Scollan, Commandant, Hibernian Rifles. 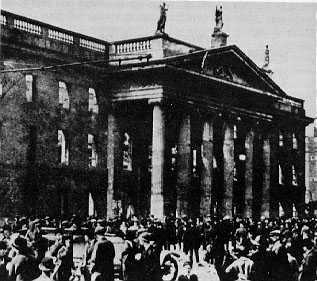 He was at The GPO in Easter 1916 with James Connolly and Michael Collins and the seven signatories to the 1916 proclamation of The Irish Republic. I am presently researching his life, having just returned from Dublin. Can You Hear me Now: A Trans-Atlantic Connection. Say what you like about him but my ‘oul man could handle a scythe. Swing it with the easy grace of a matador in a bullring in Barcelona.